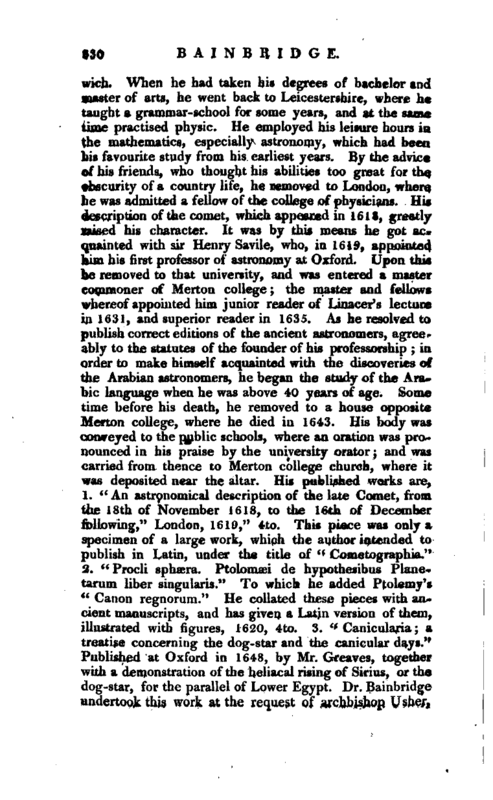 , an eminent physician and astronomer, born in 1582, at Ashby de la Zouch, Leicestershire, was educated at the public school of that town; and from thence went to Emanuel college in Cambridge, under the tuition of Dr. Joseph Hall, afterwards bishop of | Norwich. When he had taken his degrees of bachelor and master of arts, he went, back to Leicestershire, where he taught a grammar-school for some years, and at the same time practised physic. He employed his leisure hours in the mathematics, especially astronomy, which had been his favourite study from his earliest years. 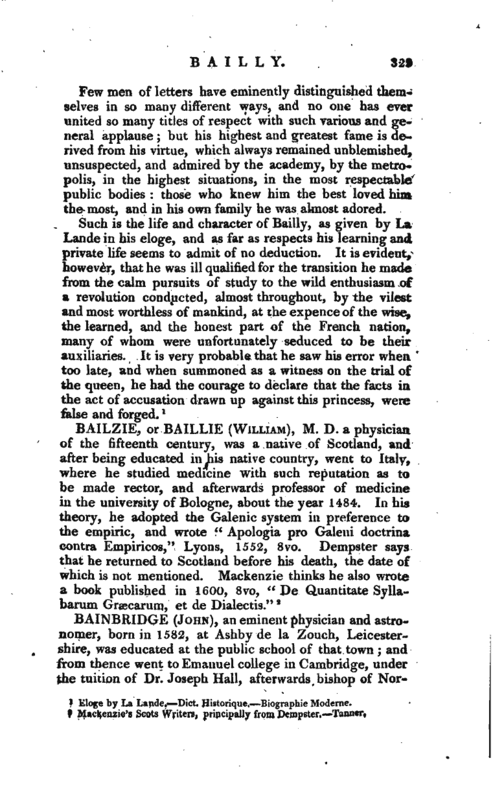 By the advice of his friends, who thought his abilities too great for the obscurity of a country life, he removed to London, where he was admitted a fellow of the college of physicians. His description of the comet, which appeared in 1618, greatly raised his character. It was by this means he got acquainted with sir Henry Savile, who, in 1619, appointed him his first professor of astronomy at Oxford. Upon this he removed to that university, and was entered a master commoner of Merton college; the master and fellows whereof appointed him junior reader of Linacer’s lecture in 1631, and superior reader in 1635. 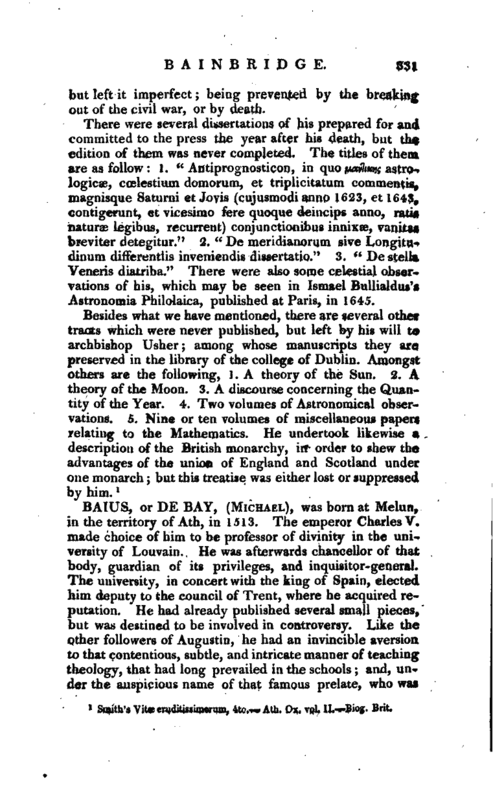 As he resolved to publish correct editions of the ancient astronomers, agreeably to the statutes of the founder of his professorship; in order to make himself acquainted with the discoveries of the Arabian astronomers, he began the study of the Arabic language when he was above 40 years of age. Some time before his death, he removed to a house opposite Merton college, where he died in 1643. His body was conveyed to the public schools, where an oration was pronounced in his praise by the university orator; and was carried from thence to Merton college church, where it was deposited near the altar. His published works are, 1. “An astronomical description of the late Comet, from the 18th of November 1618, to the 16th of December following,” London, 1619, 4to. This piece was only a specimen of a large work, which the author intended to publish in Latin, under the title of “Cometographia.” 2. “Procli sphæra. Ptolomæi de hypothesibus Planetarum liber singularis.” To which he added Ptolemy’s “Canon regnorum.” He collated these pieces with ancient manuscripts, and has given a Latin version of them, illustrated with figures, 1620, 4to. 3. “Canicularia; a treatise concerning the dog-star and the canicular days.” Published at Oxford in 1648, by Mr. Greaves, together with a demonstration of the heliacal rising of Sirius, or the dog-star, for the parallel of Lower Egypt. Dr. Bainbridge undertook this work at the request of archbishop Usher, | but left it imperfect; being prevented by the breaking out of the civil war, or by death. There were several dissertations of his prepared for and committed to the press the year after his death, but the edition of them was never completed. The titles of them are as follow[s]: 1. " Antiprognosticon, in quo manlixYis astrologicæ, cœlestium domorum, et triplicitatum commentis, magnisque Saturni et Jovis (cujusmodi anno 1623, et 1643, contigerunt, et vicesimo fere quoque deincips anno, ratis naturæ legibus, recurrent) conjunctionibus innixæ, vanitas breviter detegitur.“2.” De meridianorum sive Longitudinum differentlis inveniendis dissertatio.“3.” De stella Veneris diatriba." There were also some celestial observations of his, which may be seen in Ismael Bullialdus’s Astronomia Philolaica, published at Paris, in 1645. Smith’s Vita Bcruditissimorum, 4to, —Ath. Ox, vol, II. Biog. Brit.